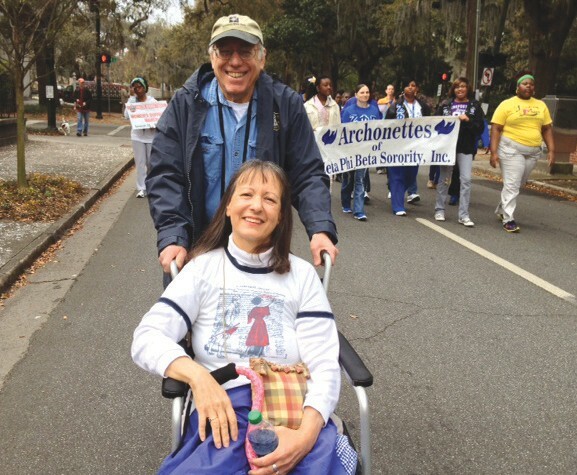 Husband pushes Sylvia Snyder, Emeritus Professor of Sociology from Coastal Carolina University in Conway, SC. 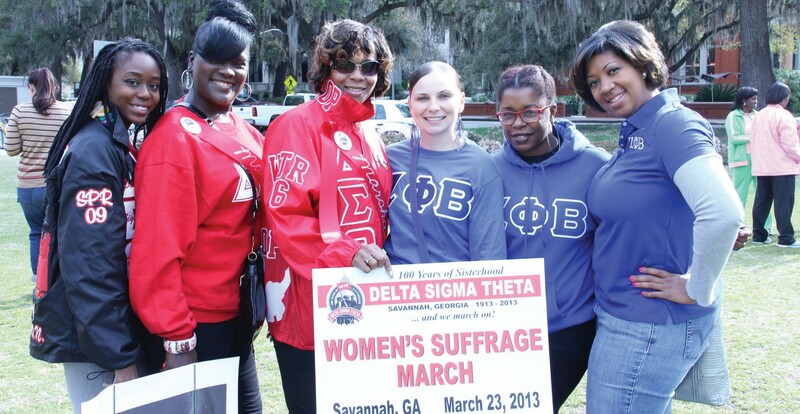 Sigma Theta Sorority, Inc. in this march as Deltas paid tribute to their twenty-two founders, the only African American group who marched in the historical 1913 Women’s Suffrage March. Patricia Harris gives instructions to former Mayor Otis Johnson, Mayor Edna Jackson, Chapter President Grayzel Ellison and others. B. James; former Mayor Otis S. Johnson who portrayed the male chaperon for the founders (Johnson is immediate past Sire Archon of Alpha Lambda Boule, Sigma Pi Phi Fraternity. 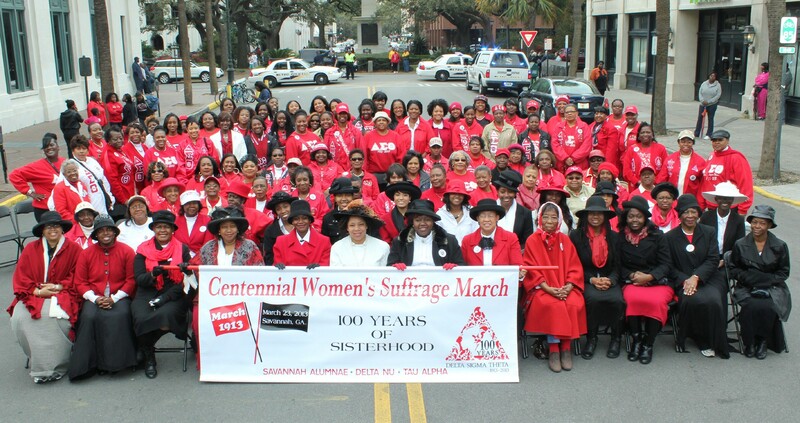 ); along with twenty-one other Deltas dressed in period clothing representing the founders. The event concluded with a brief ceremony, featuring Juvenile Court Judge Patricia Stone as the speaker. The crowd watches as the march passes. Young women participating in the Re-Enactment of the 1913 Women’s Suffrage March. 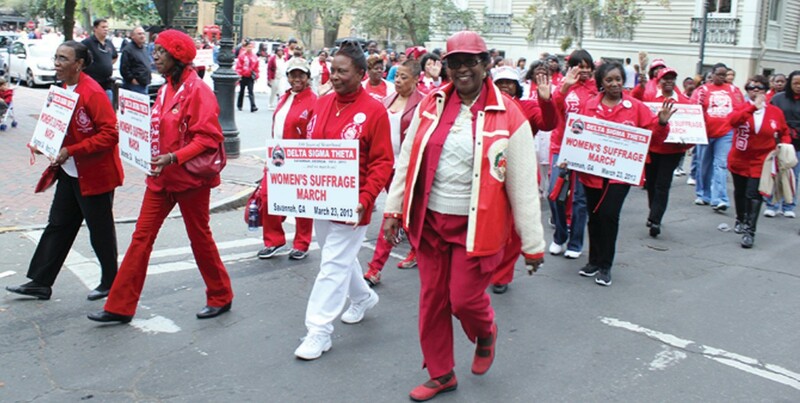 Judge Stone also pointed out Savannah’s Mayor and four City Council women who participated in the march: Alderwomen Carol Bell, Mary Osborne, Mary Ellen Sprague, and Estella Shabazz. 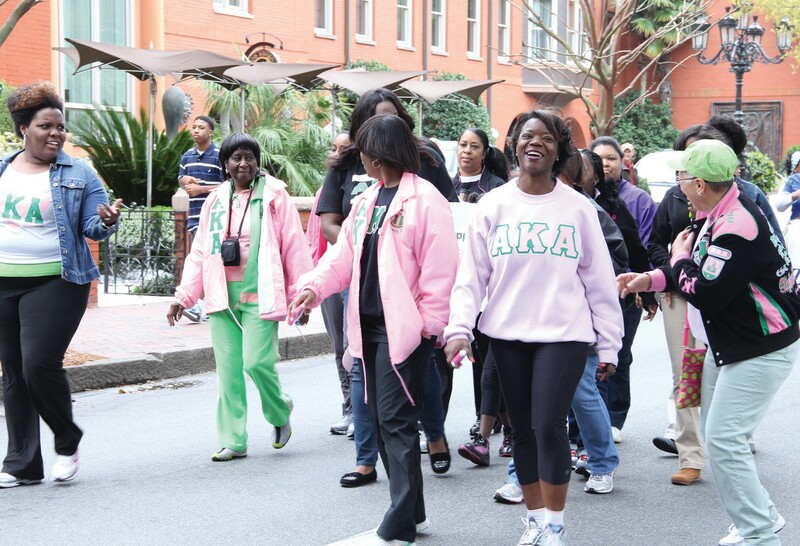 Local Alpha Kappa Alpha Sorority members participated in Women Suffrage March. Delta Sigma Theta Sorority, Inc.-Savannah Alumnae Chapter, Delta Nu Chapter (Savannah State University), and Tau Alpha Chapter (Armstrong Atlantic State University) would like to sincerely thank the entire community for its unwavering support. Special thanks are extended to all of the hundreds of women who marched and the men who served as Parade Marshalls and in various other capacities.